The bike is also tailored-fit for intense hill climbing hence its Shimano Acera 24 speed gearing enhancement. Other special features of this bike include Avid Juicy 3 hydraulic disc brakes, 2.1” aggressive tread Maxxis Ignitor tyres best suited for off road biking, Alex DP17 disc specific rims, and GT oversize bar and stem. With these features combined, the end result is a durable mountain bike design that delivers exactly what it is intended for. Just like its predecessor, GT Aggressor XC2 series, this more recent installment is also built with front suspension, alloy rims, and quick release wheels among others. 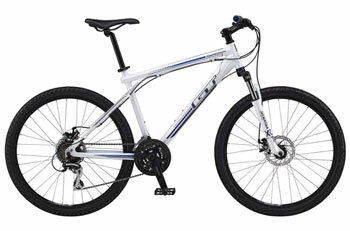 This mtb is available in either blue or silver. Online reviews have already sprouted from avid bikers who bought this product. Some of the most positive notes about the GT Aggressor XC1 Mountain Bike include its capacity for solid and smooth ride, brilliant suspension lockout system, easy gear-shift mechanism, well built structure, reliable front and rear disc brakes, and superb front forks. Satisfied users have poured in their support and recommendation for the Aggressor series, citing the bike’s flexibility and sturdiness as its major selling point. From downhill racing to off road exercise, this bike model can definitely deliver the goods. Generally, reviews have shown that the GT Aggressor XC1 mtb is worth buying. With its high end specifications, it is no less than the best deal there is in the market. One user even comments that the bike “feels steady and can take a bashing”. Now that’s a rough compliment. Among the many reviews, the only less favorable ones were directed toward the bike’s saddle. According to the users, the saddle can definitely be improved so as to make it less of a literal sore in the rear. Either way, this bike is still highly recommended by the experts who have experienced riding it already. The GT bike truly is another genius innovation from the manufacture. As one of the leading producers of quality hill climbing bikes, GT can now add the XC1 series to its pool of noteworthy achievements in bicycle technology. You can check out more customer reviews about this GT Aggressor XC1 Mountain Bike on Evans Cycles here.